A student is given a grade on an exam. Let’s say it’s an A+. A top mark. Of course, there is nothing greater than an A+. It is the best you can do. She is satisfied with her achievement. She tells her friends. She tells her parents. When compared to her previous performance, it is an improvement, as one might expect given such a grade. But then she realizes something. She realizes that everyone in the class has also received an A+ on the exam, presumably because they too have done high quality work. And she asks herself: Is the achievement diminished when compared to others? Is the scarcity of the high grade, and the competition to win it, essential to the achievement, to its value and meaning? Or, perhaps the high grade is enhanced by its abundance, knowing that she shares equally in the achievement with her peers? She thinks about what she wants. She thinks about why she wants what she wants. She considers her motivations, and the motivations of others in the class. Did she study for the deferred, extrinsic satisfactions of the grade, or did she study for the intrinsic satisfactions of learning? Maybe both. Maybe neither. It’s hard to know for sure. There is no additional marginal cost to produce extra A+’s. The grade is a non-rival good; it can be reproduced and reused ad infinitum without diminishment. And yet, most people will feel that the grade’s value has been diminished by its ubiquity. A zero sum game is a term taken from game theory to describe a situation where the gain for some players will come at the expense of others. Put simply, it is a win/lose game. By contrast, a non-zero game does not constrain the wins and loses. All players might win (positive sum game), creating more aggregate value, or all players might lose (negative sum game) destroying aggregate value, or some combination thereof where the aggregate gains and the loses are more or less than the fixed stakes. The gains and loses, however, need not necessarily be allocated equally. Zero sum bias grounds so much of the way we experience the world and the way we engage with the people around us. It grounds our shared conceptions of value, meaning, and even justice, privileging competition over collaboration. Justice, too often is punitive, too rarely restorative, typically perpetuating and compounding the very problems that a particular mode of justice is meant to ameliorate. Value, too often, is fixed within the allocation of existing resources, or rather resources that are assumed to exist. When our attention becomes too fixed in this manner, we tend to ignore other opportunities that may be hiding in plain sight. Zero sum bias is pernicious, in part, because it inhibits our creativity, limiting the solutions available to us as it rigidly constrains the way problems are framed. It is always us and them playing a two player zero sum game. It is always a game of oppositions. It is a bias that is always oriented against an Other, which inevitably leads to the problem of the Other who others another Other. The ethical question is also a design question: What kind of game should we choose to play? There are certainly times when a zero sum strategy is appropriate and necessary, but these situations are probably far rarer than most people assume. When we eschew zero sum bias, new possibilities emerge beyond the constraints we’ve accepted to be immutable. A critique of zero sum bias is therefore the necessary starting point for reframing the game. Our ethics are grounded in how we orient ourselves toward the mutability of constraints. Constraints determine the stakes, and the kinds of strategies used to play the game. A game can play out within the established constraints, or a game can play out beyond the established constraints. A zero sum game is a game where a win for one is a loss for another; when wins and losses are so constrained that no player can gain without another losing. In such a situation, the game is said to be Pareto Optimal. A Pareto Improvement is when one player can be made better off without making another player worse off, within the given constraints. But if we look closer, we may come to discover that the constraints are not as fixed as we first accepted. We may discover opportunities for Pareto Improvements even in systems we assumed to be Pareto Optimal. If we not only look closer, but also look further, beyond the established constraints, and reframe the game towards a positive sum, we may come to discover new paradigms for meaning, value, and justice, that “expand the cake”, and produce shared abundance for all stakeholders. Good design begins by cultivating awareness; by looking closer we see further. Design is everywhere. It is gives shape to reality. It provides affordances for norms, and constraints for behaviors that allow us to operate within that reality. This ready to hand infrastructure always already hides in plain sight. Once there is awareness, that awareness can be shared and shaped. The primary goal as well as the primary method of Positive Sum Design is the enhancement of awareness; affordances for communication, coordination, and collaboration between all stakeholders in order to produce greater aggregate value for everyone. 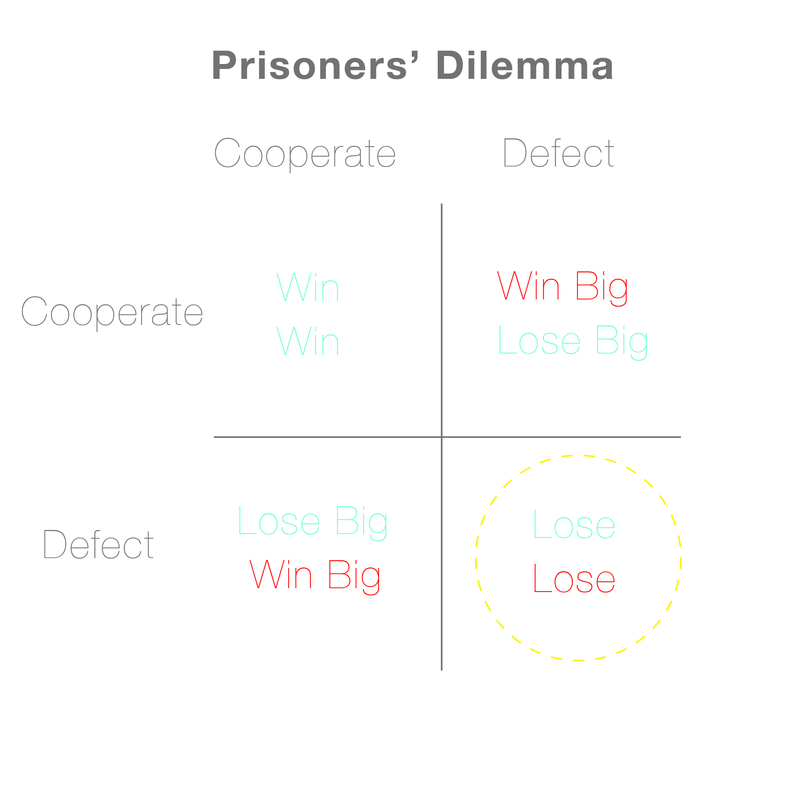 The tragedy of the Prisoners&apos; Dilemma is the inability for stakeholders to coordinate their behavior, producing negative sum outcomes. 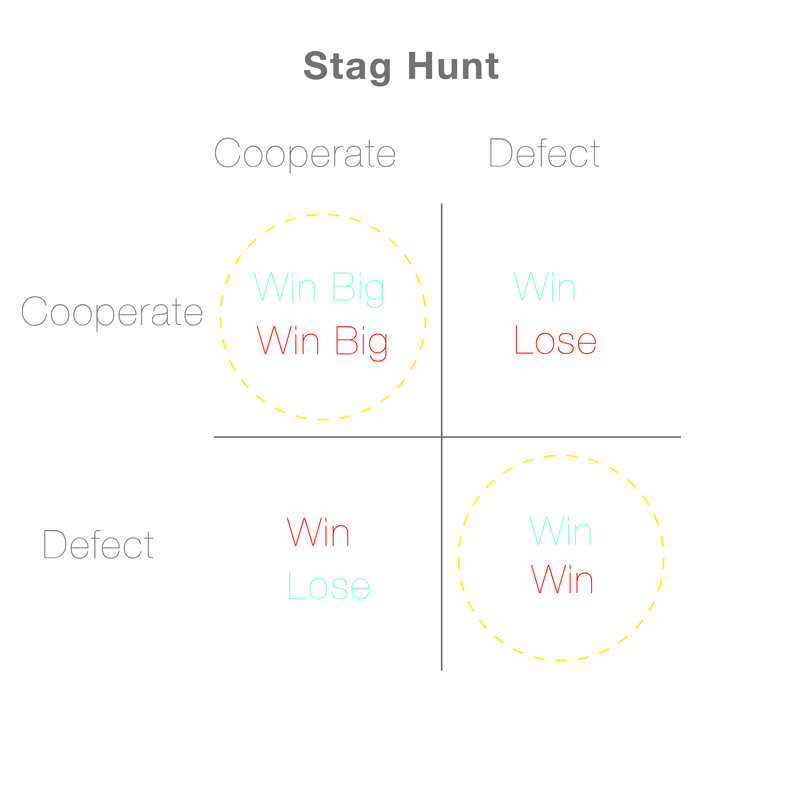 The triumph of the Stag Hunt is the affordance for coordination that produces more value for all. Stories lend structure for the artful arrangement of awareness. They orchestrate our attention through the design of narratives. Stories frame the process by establishing scenarios that can be iteratively prototyped and critiqued towards implementation. Like most stories, design scenarios ask familiar questions. What does it do? For whom? Where does it do it? What is the context? How does it do it? And why? Stories allow us to think and work through scenarios, real or imagined, in order to better understand who the players are, what is at stake, and to determine the best strategies for achieving desired outcomes. Games possess many of the same elements of stories. A “user” might also be considered a “player”, for example. The design process itself is a kind of strategy to be played – a creative practice – that moves stakeholders towards their desired goals. 1) Who are the players (users/stakeholders)? 2) What are the available strategies (behaviors/affordances)? 3) What are the stakes (resources/motivations)? These questions are meant to frame the design process by cultivating empathy with stakeholders’ in order to better understand the underlying motivations for their behaviors. Utility is a measure of preferences. Economists use this term as metric by which to determine the desirability of goods. Utility is a measure of how much we want what we want. But Positive Sum Design asks the question that follows that question: why do we want what we want? Too often, we find that our preferences are constrained by normative assumptions about value, defaulting to a zero sum bias. But if we look closer to see further, and really consider why we want what we want, we encounter the multivalence of utility. When we are open to satisfying our needs in creative ways, we discover more than we expected. The mulitvalence of utility is a move towards a more expansive territory of possibility, encouraging stakeholders to fundamentally consider how the stakes of a particular game meet their needs, and the manner in which the given options have been presented. When the stakes are liberated from the constraints of our prejudices and biases, we are better positioned to recognize abundance where we formally saw scarcity. People play games in different ways. These myriad strategies, played out by different stakeholders with different motivations, and the variety of outcomes they produce, can be represented visually. All design processes can be characterized as the iterative translation of the abstract to the concrete through modes of representation. Positive Sum Design borrows the modes of representation of game theory – such as payoff matrices for example (see figure) - in order to help designers imagine how these complex scenarios might play out. 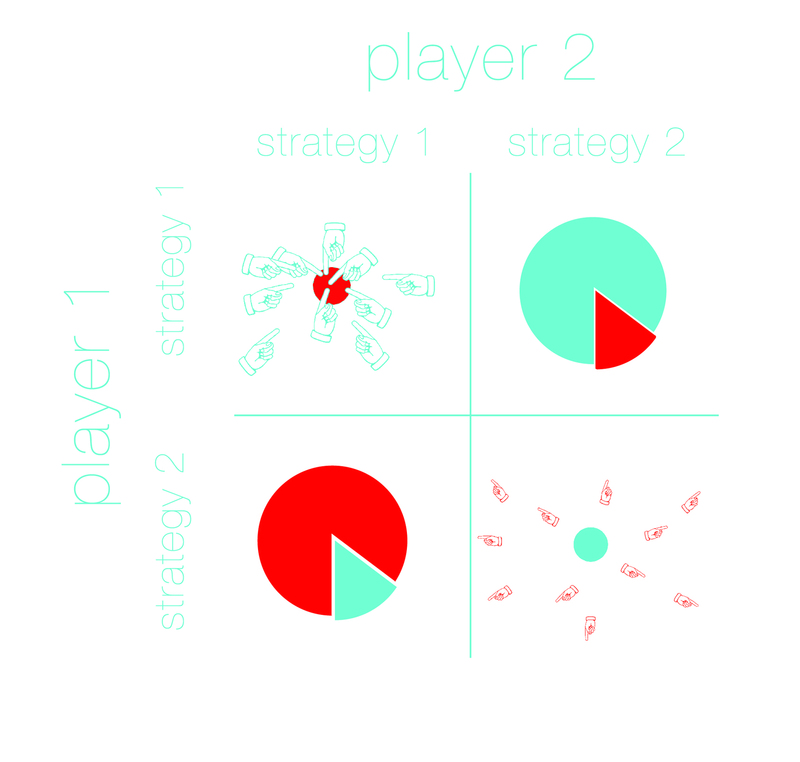 Visualizing the stakeholders, strategies, and stakes in this way gives designers different vantage points; a point of view that is oriented towards an empathetic understanding of users’ experiences, but also positioned to place those experiences in a broader context in order to design affordances for positive sum outcomes. Positive Sum Design attempts to create affordances for behavior that increase value in ways that may not have been available when constrained through the lens of bias or a limited framing of the problem. But Positive Sum Design goes a step further to design affordances for trust and communication. This kind of infrastructure for trust and communication is already being designed for the so-called sharing economy, where reputation is being deployed as a kind of currency. You are more likely to stay in a stranger’s house on Airbnb if you trust that you’ll be safe. You are less likely to let a stranger into your car if Lyft or Uber didn’t ensure the identity of the passenger, and provide the means by which to share and confirm that information with all parties. Coordinating these actions through the design of an app makes this possible. You and a fellow hunter are out hunting game. You’re hungry and getting hungrier. A stag is a big prize, and will provide enough meat for both of you to eat well. It will also require both hunters to coordinate their behavior so as not scare off any approaching stags, which may or may not appear. You cannot kill a stag alone. However, there is another option. Rabbits are abundant, and can be hunted alone. They also provide less meat. Furthermore, shooting a rabbit will also scare away the bigger game, and neither party will reap the bounty of a stag. If you coordinate your actions, based on common assumptions, communicated either explicitly or implicitly, that the other hunter will not defect, you will have a better chance of sharing a stag. However, if you do not trust that the other hunter will restrain themselves from going after rabbits, and defect, thus greatly diminishing your chances to win a stag, you too will be likely to do so. Positive Sum Design enhances the opportunities to discover abundance in situations where we might otherwise see only scarcity. 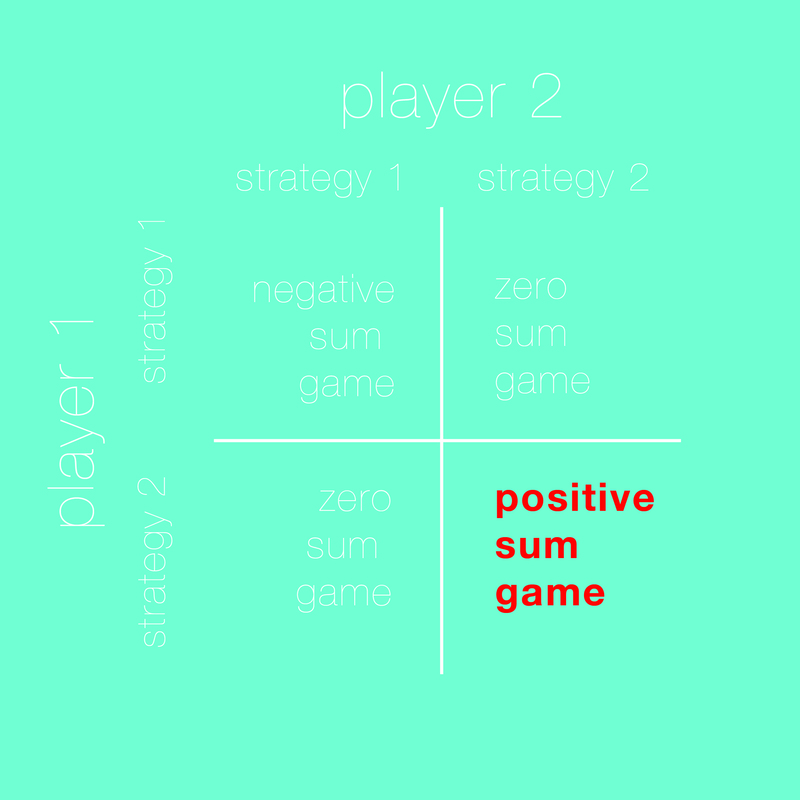 Positive Sum Design proceeds from the notion that the best solutions to complex problems are rarely to be found in zero sum games. Positive Sum Design reminds us that our ethics are grounded in how we orient ourselves towards the mutability of constraints. 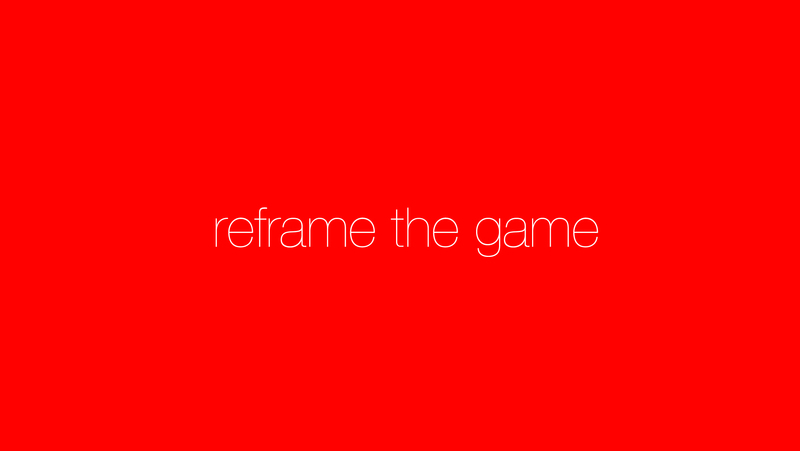 When we reframe the game, we create more value for everyone. Imagine a restaurant where the staff create meals that are works of art; where the dining experience is a product of the satisfactions of their labor, and the food is crafted and served with care, empathy, and joy. The patrons take similar satisfaction in the experience. The food nourishes their bodies as they nourish each other’s spirits in the easy flow of dinner conversation. They consume the meal with gratitude. Consider the design of the restaurant. Consider the ways it establishes affordances for this kind of experience, for the behaviors and interactions of the staff and the patrons, for the goods and services that are produced, exchanged, and consumed. The design shapes these experiences by establishing the conditions for everyone to play a positive sum game. Design processes are a series of choices. Design offers us a choice about the kinds of games that might be played; about the way the stakes are framed and negotiated between players; about the way the rules organize affordances for those behaviors, and who and what are excluded. 1) Operate within a strict logic of scarcity, often taking as a precondition assumptions about the established constraints, without creatively challenging those assumptions. They tend to produce rival and excludable outcomes. As a result, the game plays out competitively within these constraints, and obfuscates opportunities to transcend these constraints in favor of shared abundance. 2) Operate within the logic of the excluded Other, which is to say, that the value that is created is dependent on the exclusion of others to produce that value in part or in whole. Now let’s imagine that this particular restaurant is famous for its chocolate truffle cake. But it’s late in the evening, just prior to closing, and there are two parties left in the restaurant who are finishing their meals. They are about to order dessert only to discover that there is just one chocolate truffle cake left. The first impulse might be to divide and distribute the cake equally between both parties. Fair enough. But this strategy assumes that everyone wants chocolate truffle cake equally, when in practice, there will be some who want cake more and some who want it less. There will be those who have enjoyed a full meal and prefer no cake at all. There may be others still who might prefer another option — an unconsidered possibility — such as a healthier piece of fruit or an invigorating cup of espresso. The outcome of the first strategy, of distributing the cake equally between all the diners, arises from the noble impulse to accommodate everyone equally without excluding anyone. However, this type of strategy also constrains the stakes by assuming that the most chocolate truffle cake for all patrons produces the best outcome, regardless of what the players in the game actually want or need. When the measurement of value is limited to a single metric, when the problem is constrained too rigidly, to only chocolate truffle cake let’s say, we fix ourselves within the logic of scarcity and become blind to the opportunity costs associated with failing to discover other ways of satisfying needs. When trying to share things like cake, we usually default to this kind of zero sum strategy. But when we are aware of the mutability of constraints and the multivalence of utility, other opportunities to satisfy the needs of everyone present themself. When we invite stakeholders to participate in the design process, we enhance our ability to creatively discover unconsidered possibilities.By simply asking who wants chocolate truffle cake and drawing on the combined creative capacity of all stakeholders, space is cleared to meet the needs of everyone. This kind of coordinated collaboration produces positive externalities too, by incentivizing conditions for a creative culture. It gives others permission to engage in creative conversations and establishes conditions where there is a greater probability of changing a zero sum into a positive sum. It’s not just getting the biggest piece alone that produces value, but the social capital produced through creative collaboration, and the bonds that are formed by playing the game together that, in part, produce a positive sum outcome. Consider the way the design of the restaurant creates affordances for these kinds of behaviors and the value and meaning they produce. Our material culture and the built environment set the stage for these behaviors, and these affordances are usually hiding in plain sight. Begin by examining the obvious. For example, most restaurants are populated with chairs that tend to be of an equal height and of a similar, human scale, affording the opportunity for making eye contact and engaging in intimate conversation. Imagine the absurd shift in the relationships between diners at a table if the chairs were at different heights, with some closer to the floor, and others closer to the ceiling. The shift in affordances set up a very different kind of conversation, and they do so because of the design decisions that are made. Consider the design of the table and the way it sets the stage for the meal. Consider the layout of the table; of the utensils and the plates, of the salt and the pepper shakers, of the glasses of water each adjacent to a folded napkin that is to be put on your lap when you arrive. These things are put there with intention. Consider how these things and all the other accouterments of the meal create affordances for zero sum or non-zero sum behaviors. Consider the way they are used and consumed, some as rival goods, others as non-rival, and most as somewhere in between. A rival good is a good whose consumption by one person prevents consumption by another. It can be thought of as a kind of zero sum game. The food that is served at the meal is an example of a rival good, because only one person consumes what is on the plate in front of them. The menus and the tablecloths are closer to the non-rival end of the spectrum because the use by one person does not prevent another from using it as well. 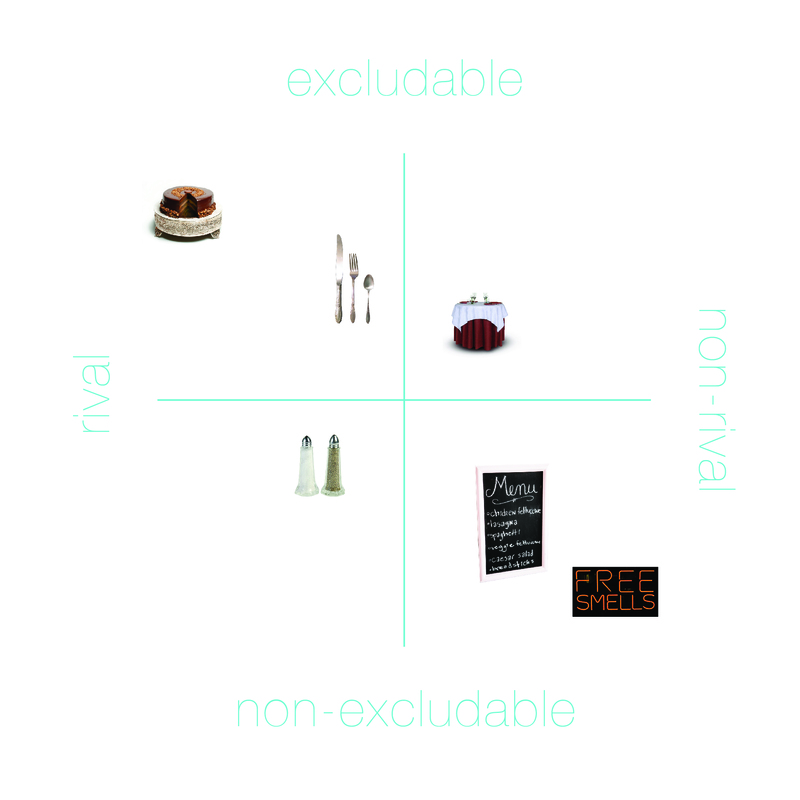 The design question to consider is where on that spectrum - between rival and non-rival - the needs and utility of stakeholders are best served. Anyone at the table may use the pepper and salt, but most people will insist on their own forks, spoons, and knives. The design decision to consider is determining what kinds of things should be designed with affordances for rivalry and what kinds of things should be designed with affordances for non-rivalry. This balance, and the balance between excludability and accessibility, are fundamental considerations for Positive Sum Design. If it is possible to prevent access to those who do not pay for a good or service, then that good or service can be said to be excludable. On the other end of the spectrum, a good or service that is accessible to anyone is non-excludable. A table at an exclusive restaurant is excludable by definition. The redolence of sweet things that waft from the kitchen to the street outside are non-excludable. A design that is both non-rival and non-exclusive is considered a public good. The problem that is often raised with regard to non-excludability is the so-called “tragedy of the commons” in which “free loaders” consume more than they contribute. It may be a problem that is less of a problem than is commonly assumed. Steven Weber proposes the neologism “anti-rival” to describe situations where value does not diminish, but rather increases, as more people engage in a non-excludable project, even if the contributions are not equal and most are de minimis. He introduces this term in an attempt to describe the magic of open source design where, “the system as a whole positively benefits from ‘free rides’. Some (small) percentage of these free riders will provide something of value to the joint product – even if it is just reporting a bug out of frustration, requesting a new feature, or complaining about a function that could be better implemented”. (Weber, 154). A social network with one person is worthless. A project that emerges from a single perspective is impoverished. Good design can create affordances for new ways of producing and exchanging value and meaning through coordination, cooperation, and trust. Design determines our experience and organizes our relationships to each other in subtle and conspicuous ways. It shapes the manner in which we choose to collaborate and share, or choose not to. It creates affordances inclusion or exclusion. It frames the way we give value and meaning to the world around us. Not all games are positive sum, but they are far more common than we might expect. The design question to consider is how to create affordances for win/wins. We may come to discover that we can have our cake and eat it too. Stephen Pinker writes in, "The Better Angels of our Nature: How Violence Has Declined", that "morality is a consequence of the interchangeability of perspectives and the opportunity the world provides for positive-sum games.”(Pinker, 182) The thesis of this important book is that despite a cultural landscape saturated with images of suffering and violence, we in fact live in the most peaceful and prosperous time in human history. Human creativity, especially over the past 200 years, and in particular since World War II, has produced institutions that allow people to be more empathetic, less violent, and more enlightened in how they creatively solve problems. Even despite a prevalent zero sum bias, we find ways to cooperate and coordinate our behaviors. The evidence presented in this meticulously researched book should be a call to any emerging designer who recognizes that the grand challenges of the 21st century will not be effectively addressed through zero sum games. In an increasingly interconnected world, with better affordances for communication, coordination, and collaboration, we find ourselves at a moment in history where our creative potential is unlimited. Gibson, J.J. The Theory of Affordances (pp. 67–82). In R. Shaw & J. Bransford (eds.). Perceiving, Acting, and Knowing: Toward an Ecological Psychology. Hillsdale, NJ: Lawrence Erlbaum. 1977. Meegan, Daniel V. “Zero-Sum Bias: Perceived Competition Despite Unlimited Resources.” Frontiers in Psychology 1 (2010): 191. PMC. Web. 8 Nov. 2016. Don Norman. The Design of Everyday Things (Revised and expanded ed. ), New York: Basic Books. 2013. Print. Rheingold, Howard. “The New Power of Collaboration”. TED. February 2005. Lecture. Weber, Steven, The Success of Open Source, Cambridge: Harvard University Press, 2004. Wright, Robert, NonZero: The Logic of Human Destiny, New York: First Vintage, 2000.